Beetroots (beets) and goat’s cheese are a perfect match. I use both in this beetroot quiche. Beetroots are a rich source of antioxidants and a wide range of nutrients (see Nutritional Information). Several studies have also shown that eating beetroots or drinking beetroot juice can lower blood pressure and increase stamina. To make my pastry healthier, I use wholegrain spelt flour. This makes a more robust and really tasty quiche pastry which I think matches the earthy taste of beetroots perfectly. 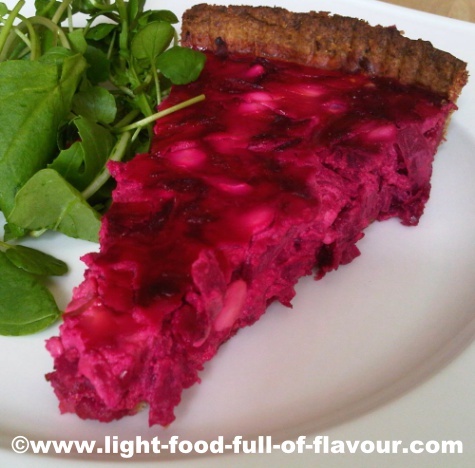 If you want a little lighter pastry for this beetroot quiche, use a mix of white and wholegrain spelt flour. I tend to make mostly vegetarian quiches when I’m cooking at home. When cooking on a job, I often make quiches with smoked salmon or crayfish (crawfish) tails, and a lighter pastry. As tasty as these more refined quiches are, I still prefer the taste of a quiche with different vegetables. And all quiches, in my opinion, taste even better the next day! I serve this quiche with a large mixed salad. For the pastry recipe, click on Pastry for Quiche. 2. Take out the pie dish from the fridge, prick the bottom with a fork, cover with baking parchment and add whatever baking beans you are using. Bake in the oven for 15 minutes. 4. Take out the pie dish and carefully remove the baking parchment and the baking beans. Return the pie dish to the oven for another 5-7 minutes until the pastry starts to brown and the bottom of the pastry is properly baked through and dry. 5. Pour the beetroot mixture into the pastry case and return the pie dish to the oven. Cook the quiche for about 30-35 minutes – until the beetroot mixture has set.